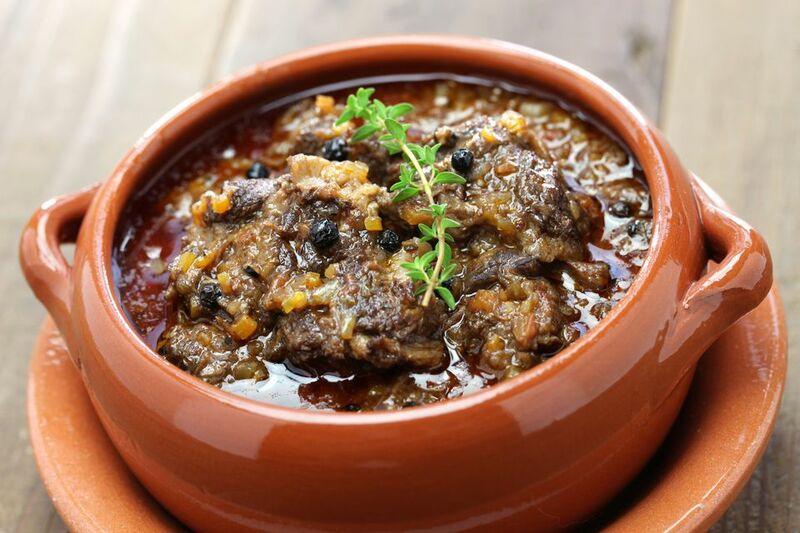 Peposo is the signature stew of Impruneta, a town south of Florence renowned for its terracotta. Indeed, it was made by the tileworkers, who would slip a stewpot into the kiln as it slowly cooled after the firing, and simmer their dinner for hours. As you might expect, the recipe goes a long way back -- the Imprunetani began making terracotta centuries before Brunelleschi came looking for roof tiles for Florence's Cathedral in the 1400s -- and though there are many published versions, purists are quick to point out that true Peposo is made without olive oil, and consequently without the soffritto (a mixture of sautéed herbs) one generally encounters in Italian stews. Tomato? "Before the discovery of the Americas Peposo was made without," Chef Cristoforo told me during a cooking demonstration held in Impruneta's Albergo Ristorante Bellavista. Imprunetani do use tomato now, but not as much as cooks from other parts of Tuscany who have begun to copy the recipe. Wine? Yes, but it's added at the end. Begin by scattering the cloves of garlic over the bottom of a large stewpot. Chef Cristoforo uses metal, but if you have a terracotta pot it would be nice here. Chop the meat into fairly large pieces, an inch or more (2.5 cm) across, and add them to the pot. 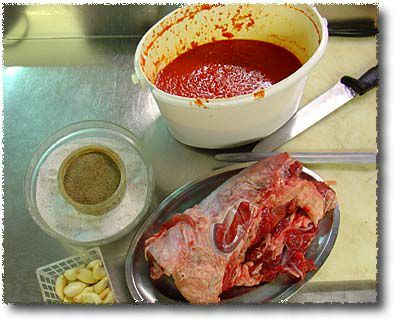 You can remove gristle if you want, but Chef Cristoforo didn't, and it does contribute to the texture of the stew.Note that there is no oil in the pot. Next, add the pepper. Chef Cristoforo went by eye, and I'd say he added a bit more than a half cup of ground pepper.This brings up a point: If you make Peposo with ground black pepper it will pack a considerable fiery zing. If you instead use whole peppercorns (increase the volume by about a third to compensate for the air between the peppercorns) the Peposo will be more delicate, with rich peppery aromas, but pack less punch. The choice is up to you. The pepper is followed by a generous dusting of salt. Next, add the tomato sauce, which should be fairly thick. Again, Chef Cristoforo went by eye, and I'd say he added about a quart. And put the pot on the stove, over a medium flame. As soon as the pot begins to bubble, cover it, turn the heat down, and simmer gently for 3-4 hours.Another option is to cook the Peposo in a slow (250 F or 125 C) oven for 4-5 hours. And Simmer; the pot in the back has simmered for 3 hours, and is done. When the Peposo has simmered, turn the heat up and stir in a bottle of dry red wine. Cook, stirring occasionally, for 20-25 minutes, and the stew is done. Here you see the pot Chef Cristoforo had just set on the stove, and, behind it, a larger pot (prepared in the morning) for us to taste. And this brings up an important point: Peposo improves with time, so if you can, make it the day ahead and reheat it come serving time. A Steaming Bowl of Peposo. A bowl of Peposo at table. What to serve it with? The traditional Tuscan accompaniments are boiled cannellini, white beans boiled with a clove of garlic, two peppercorns, a couple of leaves of sage, and a pinch of salt (added near the end), and seasoned at table with a little olive oil, or spinaci rifatti, spinach sautéed with olive oil and garlic. Though it isn't strictly Tuscan, I think Peposo also goes quite well with polenta. What to drink with peposo? At the demonstration we tasted several wines, including a full bodied white that was completely overwhelmed. The best bet, I think, is a full bodied, unoaked fruit-driven red wine, along the lines of a Chianti D'Annata, a Dolcetto, or perhaps a Valpolicella. Another option is a rich beer of the kind made by a microbrewery (as opposed to an industrial outfit). I'd suggest an India Pale Ale, or, if you want something more bracing, a Weissbier.